The main aim of this study was to see if the antilisterial action of lyophilized cell-adsorbed bacteriocin from Lactobacillus curvatus CWBI-B28 might be reinforced by simultaneous treatment with an organic acid or salt. Slices of raw pork (lean bacon) inoculated with Listeria monocytogenes (at 102 cfu/g meat) were either vacuum packaged directly and stored at 4°C or treated prior to packaging with a solution containing either lyophilized cell-adsorbed bacteriocin from Lactobacillus curvatus CWBI-B28 (at 1 g/100 mL), an organic acid or salt, or both. The organic acids/salts used were acetic acid, lactic acid, sodium acetate, sodium diacetate, potassium sorbate, and potassium benzoate and the concentrations of the corresponding solutions were calculated so as to treat each slice with approximately 0.1, 0.3, or 0.5 mg acid/salt. Of the antimicrobials used alone, LCaB had the strongest inhibitory effect (a 1-Log reduction in the Listeria cfu count after two weeks, followed by an increase). In combination with LCaB, three antimicrobials had a much more drastic effect: acetic acid, sodium diacetate, and potassium benzoate. At the highest acid/salt concentration tested in such combinations, Listeria became undetectable after one or two weeks and remained so until the end of the 6-week experiment. Post-processing contamination of meat by Listeria monocytogenes is one of the greatest meat safety risks . As the HACCP programs applied in the meat industry often appear insufficient to prevent the presence or growth of L. monocytogenes in processed meats, post-packaging hurdle technologies are needed for its control . The idea is to combine two or more hurdles, each of which can only partially inhibit Listeria growth when used alone. One strategy involves treatment with combinations of two or more antimicrobials. For example, the antimicrobial action of lactates can be reinforced by combining them with Origanum vulgare L. essential oil , sorbic acid can synergize with nisin , and organic acids and salts can potentiate the antimicrobial activity of pediocin . Like pediocin, the bacteriocin produced by Lactobacillus curvatus CWBI-B28 is a class IIa bacteriocin (more precisely, it is a sakacin P - Dortu et al.) . In a model meat system (slices of lean bacon inoculated with Listeria monocytogenes, vacuum packaged, and monitored over a 6-week period of storage at 4°C), research in our laboratory has shown that co-inoculated Lactobacillus curvatus CWBI-B28 can delay but not prevent listerial growth [7,8,9]. In the present work we have focused on the same meat system. Our aim was to evaluate the antilisterial action of lyophilized cell-adsorbed Lactobacillus curvatus CWBI-B28 bacteriocin (LCaB) spread over the meat as an aqueous solution, and to see if certain organic acids or salts might act in synergy with it. DL-lactic acid (85% w/w syrup), potassium benzoate, potassium sorbate, and sodium acetate were purchased from Sigma- Aldrich (Diegem, Belgium), glacial 100% acetic acid from Mallinkrodt (Dublin, Irlande), and sodium diacetate from Niacet (Niagra Falls, NY, USA). LCaB was prepared in our laboratory as described in . All solutions used to treat the meat were prepared in sterile distilled water. The 85% DL-lactic acid syrup and 100% glacial acetic acid were diluted 1:100, 3:100, and 5:100 (v/v); potassium benzoate and potassium sorbate were used at 3 g/100 mL; sodium acetate and sodium diacetate were used at 1, 3, and 5 g/100 mL. LCaB was used at 1 g/100 mL. The activity of this solution, determined in arbitrary units (AU) as detailed in  by means of the agar well diffusion assay described by Parente and Hill , was 4267 AU/mL. Two sets of solutions were prepared: one with each antimicrobial separately and one where each salt or acid was combined with LCaB. The raw pork meat used in this work was pre-sliced lean bacon (each slices weighed approximately 200 g and its dimensions were 15 x 7 x 1 cm. At the time of purchase and after six weeks of refrigeration in the lab, this meat was tested for the presence of Listeria and was found negative. Slices were placed on aluminium foil under a biohazard hood and inoculated on each side with 50 μL Listeria monocytogenes suspension (at 2.105 cfu/ml, so as to inoculate approximately 102 cfu per gram of meat). After an hour of adsorption, they were treated on each side with 1 ml antimicrobial solution. First, the solution was deposited on one side of each slice and spread over the surface with a sterile bent glass rod. The slice was left at 4°C for 10 min to allow attachment, and then the same procedure was repeated on the other side. Then, the treated slices were vacuum packaged and stored at 4°C for six weeks. The meat slices were sampled at regular intervals (1, 2, 3, 4, 5, 6 weeks) during incubation. At each sampling, 20-g samples were taken aseptically from the slices, diluted with 10 mL sterile saline solution (0.85% sodium chloride), and pressed manually in a Stomacher bag to extract as much liquid as possible. This liquid (called the ‘meat juice’ hereafter) was then used for microbiological (Listeria) analysis. Growth of the inoculated Listeria strains was determined on the basis of cfu counts after homogenization of 1 mL meat juice in 9 mL peptone water, as described by Katla et al. . A ten-fold dilution series was prepared and 1-mL aliquots were plated. L. monocytogenes was plated on Palcam agar and colonies were counted after incubation for 48-72 h at 37°C. Each trial was repeated twice and each determination was done in triplicate. Statistical analysis (analysis of variance α = 0.05% and Student’s t-test) was done with Excel software. Figure 1 shows the evolution, during storage at 4°C, of the L. monocytogenes cfu count in raw pork meat treated with a single antimicrobial or left untreated (control). In the untreated samples, the mean Listeria count increased from 102 to 107 cfu/g over the six-week storage period. Samples treated with LCaB alone showed a significant (P<0.05), approximately 90% decrease in the cfu count over the first two weeks, but this was followed by a growth rebound, the count reaching 4.3 x 105 cfu/g by the end of the experiment. All the other antimicrobials proved somewhat inhibitory, the Listeria cfu count increasing 10- to nearly 1000-fold over the first three weeks and stabilizing thereafter. This small but significant negative effect (p<0.05 after the first week) made it interesting to see if one or more of these agents might act synergistically with LCaB to control L. monocytogenes more effectively than any of these agents used alone. 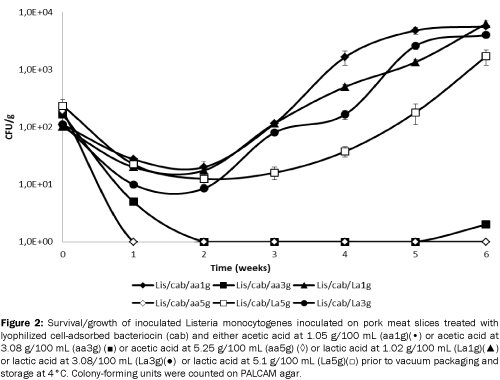 Figure 1: Survival/growth of inoculated Listeria monocytogenes inoculated on untreated pork meat slices (Ã¢ÂÂ ) and on slices treated with 100 μL cell-adsorbed bacteriocin (cab) at 4267 AU/mL(Ã¢ÂÂ¾), acetic acid at 5.25 g/100mL (aa5g) (Ã¢ÂÂ²), 5.1 g/100 mL lactic acid (La5) (Ã¢ÂÂ), 5 g/100 mL sodium diacetate (sda5g) (Ã¢ÂÂ), 5 g/100 mL sodium acetate (sa5g) (Ã¢ÂÂ), 3 g/100mL potassium benzoate (pb3g) (Ã¢ÂÂ¡), or 3g/100 mL potassium sorbate (s3g) (◊) (3g) prior to vacuum packaging and storage at 4°C. Colony-forming units were counted on PALCAM agar.. Figure 2 shows the evolution, during storage at 4°, of the L. monocytogenes cfu count in raw pork meat co-treated with LCaB and either lactic or acetic acid. The organic acids were each tested at three concentrations: 1.03, 3.08, and 5.14 g/100 mL for lactic acid (abbreviated respectively as La1g, La3g, and La5g in Fig. 2) and 1.05, 3.15, and 5.25 g/100 mL for acetic acid (respectively aa1g, aa3g, aa5g). All of the tests showed a significant (p<0.05) cfu count decrease at the end of week 2, but in most cases this was followed by a growth rebound. The most striking results were obtained with LCaB plus acetic acid at 3.15 and 5.25 g/100 mL: Listeria was undetectable after two weeks in the former case, and after only one week in the latter. With acetic acid at 3.15 g/100 mL, some regrowth occurred after the fifth week, the Listeria count reaching 10 cfu/g by the end of the experiment. This remains two to three Log units lower than with either LCaB or acetic acid used alone. 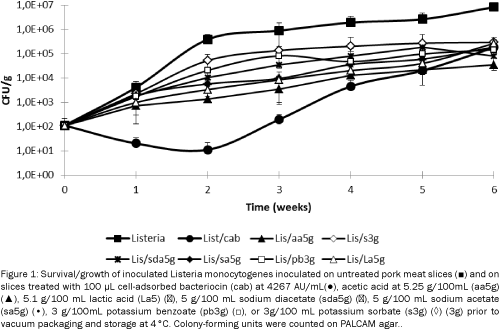 Figure 2: Survival/growth of inoculated Listeria monocytogenes inoculated on pork meat slices treated with lyophilized cell-adsorbed bacteriocin (cab) and either acetic acid at 1.05 g/100 mL (aa1g)(•) or acetic acid at 3.08 g/100 mL (aa3g) (Ã¢ÂÂ ) or acetic acid at 5.25 g/100 mL (aa5g) (◊) or lactic acid at 1.02 g/100 mL (La1g)(Ã¢ÂÂ²) or lactic acid at 3.08/100 mL (La3g)(Ã¢ÂÂ) or lactic acid at 5.1 g/100 mL (La5g)(Ã¢ÂÂ¡) prior to vacuum packaging and storage at 4°C. Colony-forming units were counted on PALCAM agar. Figure 3 shows the evolution, during storage at 4°C, of the L. monocytogenes cfu count in raw pork meat co-treated with LCaB and either sodium acetate (at 3 or 5 g/100 mL), sodium diacetate (at 3 or 5 g/100 mL), potassium sorbate (at 3 g/100 mL), or potassium benzoate (at 3 g/100 mL). The count initially decreased whatever the treatment, but the effect was slight and brief in the case of sodium acetate (both concentrations) and potassium sorbate (3 g/100 mL). A drastic effect was observed with sodium diacetate: Listeria was undetectable after one week of treatment with the more concentrated solution (5 g/100 mL) and after two weeks when the less concentrated solution was used (3 g/100 mL). In the latter case, regrowth occurred after 5 weeks, the count reaching 5 cfu/g by the end of the experiment. Potassium benzoate at 3 g/100 mL also reduced the Listeria count to below the detection level by the end of week 2, and no growth rebound was observed. 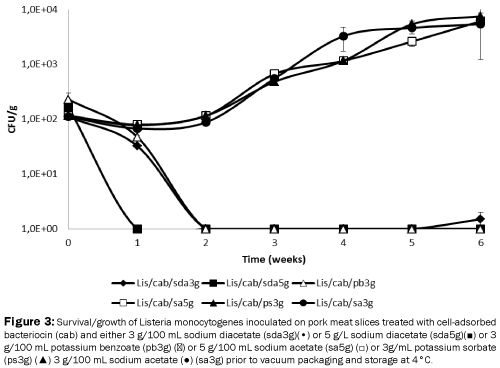 Figure 3: Survival/growth of Listeria monocytogenes inoculated on pork meat slices treated with cell-adsorbed bacteriocin (cab) and either 3 g/100 mL sodium diacetate (sda3g)(•) or 5 g/L sodium diacetate (sda5g)(Ã¢ÂÂ ) or 3 g/100 mL potassium benzoate (pb3g) (Ã¢ÂÂ¡) or 5 g/100 mL sodium acetate (sa5g) (Ã¢ÂÂ¡) or 3g/mL potassium sorbate (ps3g) (Ã¢ÂÂ²) 3 g/100 mL sodium acetate (Ã¢ÂÂ) (sa3g) prior to vacuum packaging and storage at 4°C. Transient inhibition of Listeria monocytogenes by Lactobacillus curvatus CWBI-B28 has been observed previously in the meat system used here . It is due mostly to the bacteriocin produced by the strain, since a bacteriocin-negative derivative of this strain is unable to inhibit Listeria growth [8,9]. Class IIa bacteriocins are known to kill bacteria by forming pores in the bacterial membrane, thus disrupting the proton-motive force and causing ATP depletion . Here, instead of co-inoculating the meat with Lactobacillus curvatus CWBI-B28 cells, we have used a preparation of lyophilized cell-adsorbed bacteriocin. Although an initial 10- fold inhibitory effect was observed after two weeks of storage at 4°C, growth resumed thereafter (Figure 1). Similar results have been reported for L. monocytogenes exposed to broth containing the Class I bacteriocin nisin . The cause of this growth rebound is unclear. One cause may be bacteriocin degradation over the storage period by bacterial or meat enzymes . This hypothesis is supported by the fact that when the plasmid responsible for bacteriocin production in Lactobacillus curvatus CWBI-B28 was introduced into a less proteolytic strain, regrowth was significantly delayed . Another process that might contribute to regrowth is inactivation of the bacteriocin by nonspecific adsorption to lipids in the meat sample, as observed with nisin . Also with nisin, investigators have found resistant mutants to appear over time [16-18]. When tested individually, all of the organic acids and salts investigated here, which are all commonly used as food preservatives [19,20], showed some ability to reduce the growth of Listeria monocytogenes over the six-week storage period (Figure 1). Their effect was quite small, however, since at the end of the six-week storage period and in the best of cases (acetic acid at 5.25 g/100 mL), the listerial cfu count was only one Log unit lower than in the untreated control. According to one mechanism proposed for the antimicrobial action of organic acids [21,22], cell damage is caused by passive penetration of the nondissociated form into the bacterial cell, followed by its dissociation inside the cell. This should lower the internal pH, disrupt the proton-motive force, and inhibit substrate transport . In this perspective, assuming that the pH of the environment of the Listeria cells is close to that of the applied treatment solution, one would expect the acids (acetic acid, lactic acid, diacetate) to have a stronger antilisterial action than the salts. It should be mentioned; however, that the latter can also affect cells by lowering the water activity , and that some salts might exert more specific effects on cell metabolism. Furthermore, as lactic acid dissociates more readily than acetic acid, is less lipophilic, and in the experiment of Figure 1 was used at lower molar concentration (0.57 versus 0.87 M), one would expect it to be less effective than acetic acid. In actual fact, no significant difference was observed between the effects of the tested agents. Our main question was: can any of these acids/salts synergize strongly with LCaB? The answer is yes. As shown in Figures 2 and 3, acetic acid (at 3.15 and 5.25 g/100 mL), diacetate (at 3 and 5 g/100 mL), and potassium benzoate (at 3 g/100 mL) proved able to render Listeria undetectable for at least three weeks. The similar effect of diacetate and acetic acid is not surprising, since diacetate contains 40% acetic acid. The comparatively low antilisterial activity of sodium acetate suggests that a low pH is essential to the observed effect. How do LCaB and organic acids influence each other's action? The antimicrobial activity of bacteriocins such as nisin, sakacin P, and curvacin A is known to be enhanced at low pH [25,26]. In the case of pediocin, a low external pH has been found to favor the first step in pore formation: binding of the antimicrobial agent to the bacterial membrane . Furthermore, as both LCaB and organic acids act to disrupt the proton-motive force, they might reinforce each other's action at this level. The most surprising result is the strong synergy of LCaB with potassium benzoate, which should somewhat raise rather than lower the pH of the Listeria cell environment. Does benzoate interact directly with LCaB? Does LCaB facilitate entry of benzoate into the Listeria cells? Does benzoate exert a specific action once inside the cells? Answers to such questions must await further study [28,29]. In conclusion, treating Listeria-contaminated meat surfaces with a solution of acetic acid, diacetate, or benzoate in combination with L. curvatus bacteriocin appears as a promising way to inhibit listerial growth. The possibility that benzoate might exert a specific effect in the presence of LCaB deserves further study. Work involving different meat systems, longer storage periods, and optimization of additive concentrations is also needed to see just how effective this approach can be. Centers for Disease Control & Prevention (CDC) Public Health dispatch: Outbreak of listeriosis—Northeastern United States, MorbMor Week Rep 2002; 51: 950–951. Hereu A, et al. High hydrostatic pressure and biopreservation of dry-cured ham to meet the Food Safety Objectives for Listeria monocytogenes.Inter J Food Microbiol2012; 154: 107-112. Jefferson C. et al. Combination ofOriganumvulgareL. essential oil and lactic acid to inhibit Staphylococcus aureusin meat broth and meat model. Braz J Microbiol2012; 43: 1120–1127. Zhou F, et al. Synergistic effect of thymol and carvacrol combined with chelators and organic acids against Salmonella Typhimurium.J Food Prot2007; 70: 1704-1709. KumarB,et al. Assessment of stability and biopreservative effect of recombinant pediocin CP2. Inter J Food FermenTechnol2012; 2: 149–156. Dortu C, et al. Anti-listeria activity of bacteriocin-producing Lactobacillus curvatus CWBI-B28 and Lactobacillus sakei CWBI-B1365 on raw beef and poultry meat. LettApplMicrobiol2008; 47: 581–586. Kouakou P, et al. Plasmid-associated bacteriocin production by Lactobacillus LMG21688 suppresses Listeria monocytogenes growth rebound in a food system.FEMS Microbial. Lett 2010; 306: 37-44. Kouakou P, et al.Enhancing the antilisterial effect of Lactobacillus curvatus CWBI-B28 in pork meat and cocultures by limiting bacteriocin degradation. Meat Sci2008; 80: 640–648. Kouakou P, et al. Effects of curing sodium nitrite additive and natural meat fat on growth control of Listeria monocytogenes by the bacteriocin-producing Lactobacillus curvatus strain CWBI-B28. Food Microbiol2009; 26: 623–628. Parente E andHill C. A comparison of factorsaffecting the production of twobacteriocinsfromlacticacidbacteria. J ApplBacteriol1992; 73: 290–298. Katla T, et al. Inhibition of Listeria monocytogenes in cold smoked salmon by addition of sakacin P and/or live Lactobacillus sakei cultures. Food Microbiol2001; 18: 431–439. Devi SM, et al. In situ production of pediocin PA-1 like bacteriocin by different genera of lactic acid bacteria in soymilk fermentation and evaluation of sensory properties of the fermented soy curd.J Food SciTechnol2014; 51: 3325-3332. Guo Y, et al. Identification of a new Bacillus licheniformis strain producing a bacteriocin-like substance.J Microbiol2012; 50: 452-458. Reeves P (2012)Thebacteriocins(Vol. 11) Springer Science & Business Media. Choi KY, et al. Cationic host defence peptides: multifaceted role in immune modulation and inflammation.J Innate immunity2012; 4: 361-370. Teixeira V, et al.Role of lipids in the interaction of antimicrobial peptides with membranes.Progress in lipid research2012; 51: 149-177. Taormina PJ. Implications of salt and sodium reduction on microbial food safety.Cri Rev Food SciNutr2010; 50: 209-227. Albarracín W, et al. Salt in food processing; usage and reduction: a review.Inter J Food SciTechnol2011; 46: 1329-1336. Lacombe A, et al.Antimicrobial action of the American cranberry constituents; phenolics, anthocyanins, and organic acids, against Escherichia coli O157: H7.Inter J Food Microbiol2010; 139: 102-107. Riemensperger AV, et al.The effect of an organic acid blend, cinnamaldehyde and a permeabilising substance on the inhibition of bacterial growth in vitro and growth performance of weaning pigs.Vet Med Zoot2012; 60: 59-66. Rousk J, et al. Soil bacterial and fungal communities across a pH gradient in an arable soil.The ISME Journal2010; 4: 1340-1351. Borges A, et al. Antibacterial activity and mode of action of ferulic and gallic acids against pathogenic bacteria.Microbial Drug Resistance 2013;19(4): 256-265. Jaquette CB and Beuchat LR. Combined effects of pH, nisin, and temperature on growth and survival of psychrotrophicBacillus cereus.J Food Prot1998; 61: 563-570. Gänzle MG, et al. Effect of ecological factors on the inhibitory spectrum and activity of bacteriocins.Inter J Food Microbiol1999; 46: 207-217. Chen Y, et al. Electrostatic interactions, but not the YGNGV consensus motif, govern the binding of pediocin PA-1 and its fragments to phospholipid vesicles.Appl Environ Microbiol1997; 63: 4770-4777. Rebuffat S (2011) Bacteriocins from Gram-Negative Bacteria: A Classification? InProkaryotic Antimicrobial Peptides(pp. 55-72). Springer New York.